We love cilantro and all of it’s amazing health benefits. The combination with fresh mint knocks it out of the park. This is a very easy dish to make, and you can prepare it in advance if you are having a dinner party. All these ingredients work really well together to give you a wonderful clean and light taste. This recipe feeds 2 of us or 3 normal people 🙂 You will have a little bit of left over pesto, but that will work beautifully on some sunny side up eggs or however you like them. It’s also great on a nice juicy chicken breast! If you do have left overs and you put it in the fridge it also acts as a butter, because it gets hard from the coconut oil and almond butter. This has become one of my personal condiment favorites. Would love to know what you think of it. I used two large cod fillets, each about 12 inches long, enough to cover a lasagna pan. Pre-heat oven to 200 F and ad a tablespoon of unsalted butter, shove in the oven and allow to melt, then place fish on top, and set aside. Heat convection oven to 450 F.
Now cover the cod with the thick and creamy paste thoroughly and bake for about 20 minutes, depending on your oven. 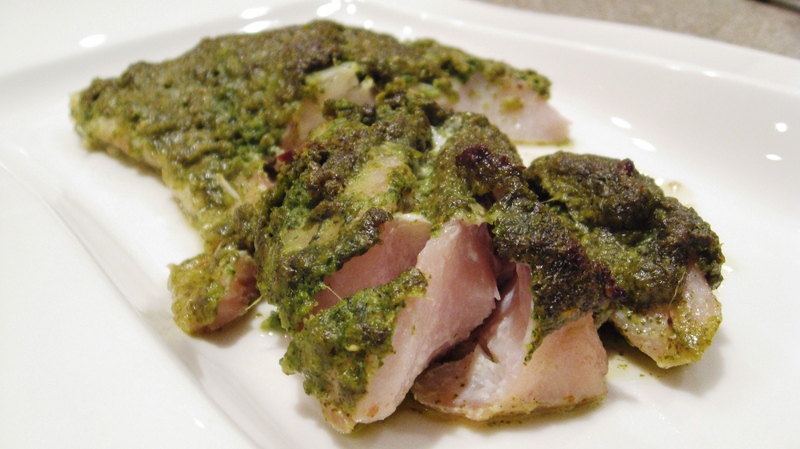 The fish should be flaky as in the picture and the pesto should begin to almost crust over. Serve immediately with you favorite side dish.